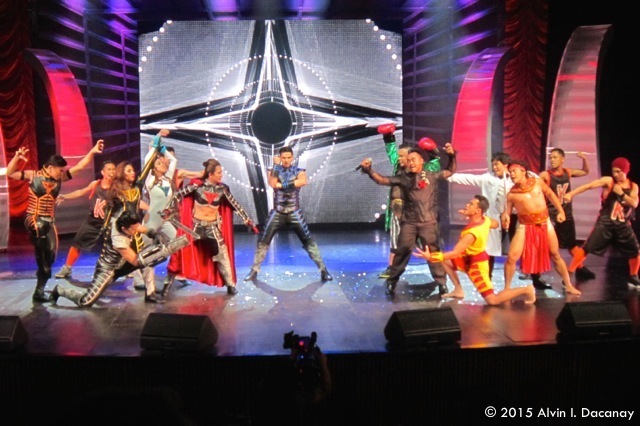 Home / Limelight / ‘Rak of Aegis’ dominates 7th Gawad Buhay! 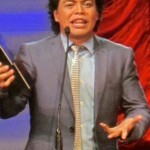 ‘Rak of Aegis’ dominates 7th Gawad Buhay! 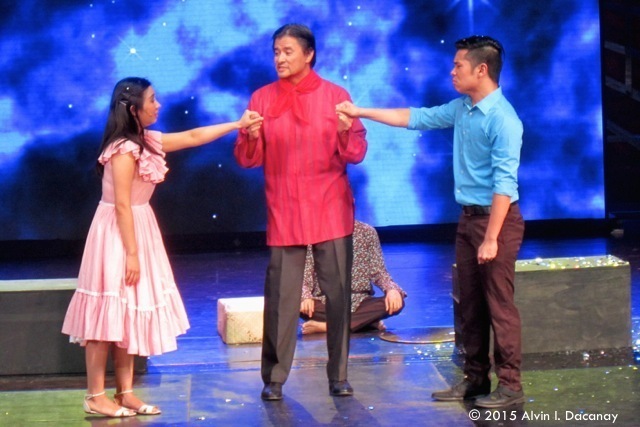 Actors Aicelle Santos and Jerald Napoles perform a number from “Rak of Aegis” during the Seventh Gawad Buhay! ceremony at the Cultural Center of the Philippines’s Tanghalang Aurelio Tolentino. 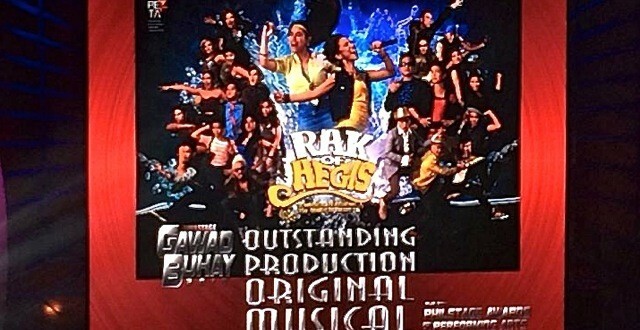 Rak of Aegis, the hit Philippine Educational Theater Association (Peta) musical that uses the songs of pop-rock band Aegis to tell the story of a young woman who dreams of achieving YouTube stardom, and the problems facing her perpetually flooded village, swept the Seventh Gawad Buhay! awards, earning 11 trophies at a three-hour-plus ceremony hosted by actor Topper Fabregas and held at the Cultural Center of the Philippines’ Tanghalang Aurelio Tolentino in Pasay City last Thursday night. Enterting the ceremony with a leading 17 nominations, Rak of Aegis won Outstanding Original Musical; Outstanding Ensemble Performance in a Musical; Outstanding State Direction for a Musical for Maribel Legarda; and Outstanding Libretto for prize-winning playwright Liza C. Magtoto. 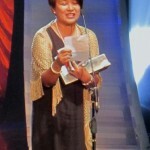 In her acceptance speech, Magtoto tweaked the lyrics of an Aegis tune in thanking her collaborators, esteemed playwrights’ group Writer’s Bloc, and Peta. 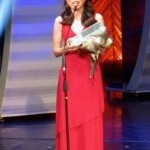 Kim Molina, one of three actresses who played Rak of Aegis’s stardom-dreaming Aileen, earned the Outstanding Female Lead Performance in a Musical prize. 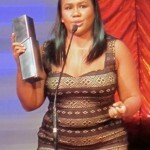 In her speech, a slightly dazed Molina thanked alternate and fellow nominee Aicelle Santos for bringing her into the production. 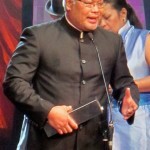 One of their co-stars, Pepe Herrera, who won plaudits as lovelorn ferryman Tolits, garnered the Outstanding Male Featured Performance in a Musical award, and used his speech to thank his mother for encouraging him to follow his passion—singing—instead of taking up advertising at the University of Santo Tomas. He also briefly promoted Rak of Aegis’ latest run, which will begin on Wednesday, while on stage. “Rak of Aegis” choreographer Gio Gahol accepts the Outstanding Ensemble Performance in a Musical prize as some cast members, including Pepe Herrera (behind Gahol), Kalila Aguilos (fourth from right), Jerald Napoles (second from right) and Myke Salomon (far right), listen. Another Rak of Aegis performer, Myke Salamon, also won, but for Outstanding Lighting Design—shared with Happy Constatino—and Outstanding Musical Direction. Production designer Mio Infante, costume designer Carlo Pagunaling and choreographer Gio Gahol were also honored for their work in the musical. (From left) Actors Jon Santos, Michael Williams and Red Concepcion sing Cyndi Lauper’s “True Colors,” from “Priscilla, Queen of the Desert,” during the Seventh Gawad Buhay! ceremony. Priscilla, Queen of the Desert: The Musical (Full House Theater Co.), which was adapted from the 1994 Australian comedy of the same title and staged at Resorts World Manila, clinched prizes for Outstanding Production of Existing Material for a Musical; Outstanding Male Lead Performance in a Musical for Red Concepcion, who played drag queen Felicia; and Outstanding Female Featured Performance in a Musical for Bituin Escalante, who portrayed one of the Divas. 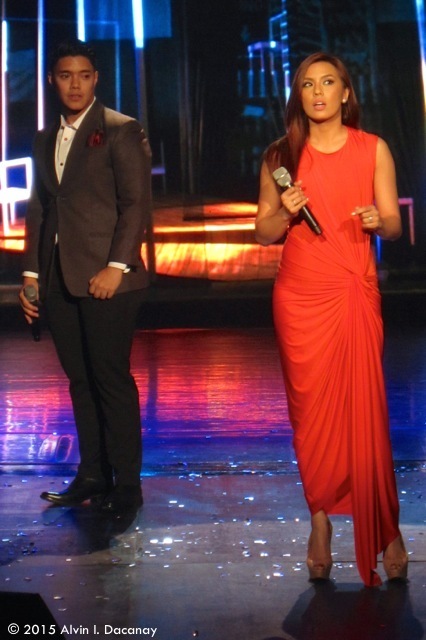 Actors Joaquin Valdes and Nikki Gil, the stars of the nominated 9 Works Theatrical musical “The Last Five Years,” perform a number during the Seventh Gawad Buhay! ceremony. Another top winner was August: Osage County, Repertory Philippines’s production of Tracy Letts’s 2008 Tony- and Pulitzer Prize-winning play that was later turned into an 2013 Oscar-nominated film starring Meryl Streep and Julia Roberts. The play collected five trophies in all: Outstanding Production of Existing Material for a Play; Outstanding Ensemble Performance in a Play; Outstanding Stage Direction of a Play for Chris Millado, who was also nominated for helming Pahimakas sa Isang Ahente, Tanghalang Pilipino’s (TP) production of Arthur Miller’s classic play Death of a Salesman; and Outstanding Female Featured Performance in a Play, shared by Liesl Batucan and Tami Monsod, who play sisters Karen and Ivy Weston, respectively. 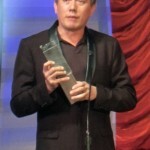 Millado praised the actors of both August and Ahente upon accepting his award, crediting them for “definitely putting the ‘fun’ back in ‘dysfunction,’” while August actress Sheila Francisco, as she claimed the outstanding-production prize on her collaborators’ behalf, said, “Thank you, God! You rock…of Aegis!”—a witty remark that was greeted with laughter. Ahente did not go empty-handed, though: The play won Outstanding Male Featured Performance in a Play for Yul Servo, who played the title character’s elder son Biff Loman; and Outstanding Translation or Adaptation for the late National Artist for Literature and Theater Rolando Tinio. 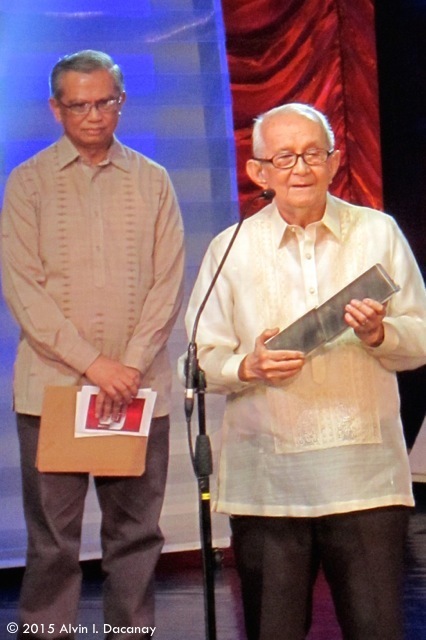 A pair of screen veterans triumped in the Outstanding Male and Female Lead Performance in a Play categories: Robert Arevalo, as domineering patriarch Zacarias Monzon in TP’s Mga Ama, Mga Anak, translated by National Artist for Literature Virgilio Armilio and Jose “Pete” Lacaba’s from the late National Artist for Literature Nick Joaquin’s play Fathers and Sons; and Cherie Gil, who portrayed fashion icon Diana Vreeland in Actors Actors Inc.’s Full Gallop. The cast of Dalanghita Productions’s hit musical “Kung Paano Ako Naging Leading Lady” freeze after performing the songs “Fuwerza Filipinas” and “Kayumanggilas” in a special production number during the Seventh Gawad Buhay! ceremony. Host Topper Fabregas had promised that he would try to make the ceremony shorter than “Leading Lady,” which runs for more than three hours. He failed to keep it. 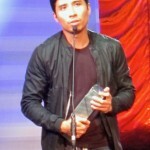 In the dance categories, Ballet Philippines, the CCP’s resident ballet company, waltzed off with seven prizes, including Outstanding Modern Dance Production for La Revolucion Filipina; Outstanding Male and Female Lead Performance in Modern Dance for Richardson Yadao in La Revolucion Filipina and Carissa Adea in “Songs of the Wayfarer,” from The Blue Moon Series, respectively; Outstanding Male and Female Lead Performance in Classical Dance for Earl John Arisola and Denisa Parungao in Cinderella, respectively; and Outstanding Female Featured Performance in Classical Dance for Katherine Trofeo in Cinderella. Dulaang Sibol founder Dr. Onofre Pagsanghan speaks after accepting the Natatanging Gawad Buhay! for Lifetime Achievement while presenter Dr. Paul Dumol looks on. During the ceremony, the Philippine Legitimate Stage Artists Group (Philstage), the 18-year-old organization of Philippine professional performing-arts companies that hands out of the Gawad Buhay!, honored this year’s recipients of the Natatanging Gawad Buhay!—Dr. Onofre “Pagsi” Pagsanghan, founder of what’s now Dulaang Sibol of the Ateneo High School, and puppet-theater pioneer Dr. Amelia “Amel” Lapeña-Bonifacio, who wrote the classic play Sepang Loca and who established Teatro Mulat ng Pilipinas at the University of the Philippines in Diliman—for their invaluable contributions to Philippine theater. As a tribute to Pagsanghan and Bonifacio, excerpts from Dulaang Sibol’s Sinta and a Teatro Mulat puppet play were performed, while former students—playwright Paul Dumol for Pagsanghan; actor-writer-director Dennis Marasigan and actress-screenwriter Bibeth Orteza for Bonifacio—talked about their professors’ influence on them and Philippine theater in general. Actors perform a scene from Dr. Onofre Pagsanghan and Dulaang Sibol’s “Sinta” during the Seventh Gawad Buhay! ceremony. For her part, 85-year-old Bonifacio thanked her husband Manuel for what she called the “two ‘Ms’: moral support and monetary support” and, addressing those who dismiss her puppet-theater work as “puppets lang,” emphasizes the fact that a lot of serious work goes into puppetry. 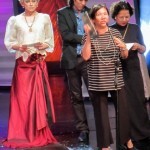 Teatro Mulat ng Pilipinas founder Dr. Amelia Lapeña-Bonifacio (right) speaks after accepting the Natatanging Gawad Buhay! for Lifetime Achievement as former students and writer-performers Bibeth Orteza and Dennis Marasigan look on. 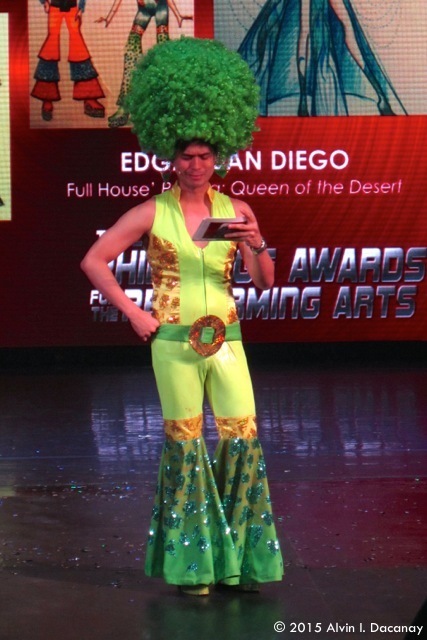 Host Topper Fabregas wears one of the nominated costumes from “Priscilla, Queen of the Desert” during the Seventh Gawad Buhay! ceremony.